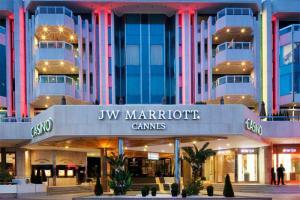 With a magnificent setting along the Cote d'Azur, this sophisticated hotel is just a short walk from the city's most popular attractions including the Palais des Festivals. Hop on the train and explore the French Riviera during your visit. Bight and airy guest rooms featuring plush bedding, oversized bathrooms, WiFi, floor-to-ceiling windows and sweeping views of Cannes. Relax by the outdoor pool or work out at the fully-equipped fitness center. Located about 14 miles from Nice Côte d'Azur Airport.